iData™ is a flexible, easy to use, freeform text database with optional, user-defined fields)for the Macintosh, iPad, iPhone and iPod Touch. Do you find yourself writing notes on a napkin in a restaurant, or on the back of an envelope? Using iData instead will allow you to find those notes easily in the future. Or, perhaps you have important information that would be useful to have at your fingertips wherever you go. Whether it is a collection of instructions for processes used in your profession, or an inventory of your DVD collection, iData Mobile Plus is a great way to have them on your iPhone and iPad. • Like its Mac predecessors -- QuickDEX, and InfoGenie -- iData is an excellent way to have miscellaneous information at your fingertips. • Extensive record filtering and text searching options make it easy to locate your data quickly, even in very large datafiles. • You structure the database the way you want it. It can be as simple or as complex as you want. • A variety of import functions allow you to bring in your existing information from a variety of sources. A few examples of the kinds of data that iData can handle are: a collection of great quotations, patient records, a collection of song lyrics, Web page bookmarks with notes to help identify them, descriptions and information on various plant or animal species, collection inventories, important text messages, email archives, the Messier Objects or NGC list for amateur astronomers, detailed descriptions of drugs, tap drill sizes, club rosters, shopping lists, to do lists, country code abbreviations, state or province abbreviations, knitting needle sizes you already have, and there are many more possibilities. NOTE: iData Kwik™ is no longer available. NEW! How to encrypt and password protect your data on the Mac. 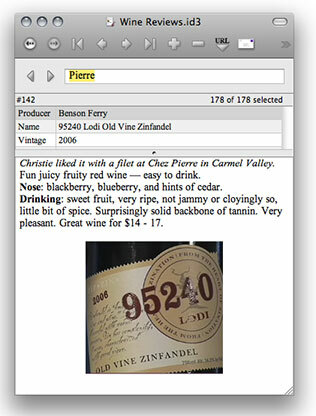 The Mac version of iData supports styled text, images, and movie files in the freeform text area. In addition to individual records and entire datafiles, printing features include batch or individual envelopes and labels. Phone numbers can be dialed through FaceTime, and —where practical— with a modem or through speakers. iData Pro also includes synchronization of datafiles between two Macs or between a Mac and an iPad, iPhone, or iPod Touch. iData Mobile Plus is an iPad, iPhone, and iPod Touch app that can be used by itself, or in conjunction with iData Pro on a Mac. This is a rewrite of our iData Mobile app. It includes a number of improvements, the most notable being that it supports styled text and embedded images. Images may be added from your Photo Library or from the Camera. Users of iData Pro 1.0 for OS 9, InfoGenie, and QuickDEX, you can import your data into iData Pro. Instructions are in the Read Me file that comes with iData Pro.